The Memphis Tigers football team represents the University of Memphis in college football at the NCAA Division I Football Bowl Subdivision. The Tigers currently play in the American Athletic Conference as an all-sports member. They play home games at Liberty Bowl Memorial Stadium. Mike Norvell is the head coach, as he was formally introduced on December 4, 2015. Since their inaugural season in 1912, the Memphis Tigers have won over 450 games and appeared in nine bowl games. The program has also claimed 5 conference championships with the most recent title coming in 2015 as a member of the American Athletic Conference. West Tennessee State Normal School <http://www.memphis.edu/about/umhistory.php.>(now the University of Memphis) first fielded a football team in 1912. The team was coached by Clyde Wilson. In 1922, Lester Barnard was the Tigers head coach. His team compiled a 5–2–2 record. From 1937 to 1938, Allyn McKeen coached the Tigers, compiling a 13–6 record. His 1938 team went undefeated at 10–0. McKeen departed the Tigers after two seasons to accept the head football coach position at Mississippi State and was inducted into the College Football Hall of Fame as a coach in 1991. West Tennessee State Teacher's College changed its name to Memphis State College in 1941. The Tigers did not field a football team from 1943–1945 due to the events surrounding World War II. Billy Murphy served as head football coach for the Tigers for fourteen seasons, compiling a record of 91–44–1. Murphy's 1963 team was the school's first undefeated team in twenty-five years, and Murphy was named national coach of the year for the team's successes. The team finished ranked #14 in the UPI Coaches Poll, the highest final ranking in school history. Murphy retired after the 1971 season. Fred Pancoast came to Memphis from his post as offensive coordinator at Georgia. In three seasons, he led the Tigers to a 20–12–1 record. 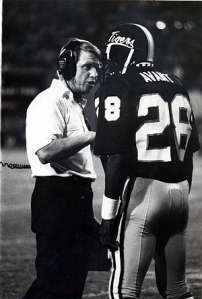 Pancoast left the Tigers after the 1974 season to accept the head football coach position at Vanderbilt. Richard Williamson, previously offensive coordinator at Arkansas, was hired to take over the Tigers after Pancoast's departure. Williamson's teams finished 7–4 (1975, 1976), 6–5 (1977), 4–7 (1978), 5–6 (1979), and 2–9 (1980). Williamson was honored with the Southern Independent Conference Coach of the Year award twice, but was fired as head coach of the Tigers after six seasons due to the team's declining performance. Rex Dockery was hired away from Texas Tech as the Tigers new head coach after Williamson's firing. He had an 8–24–1 record at Memphis State, starting his tenure with back-to-back 1–10 seasons and going 6–4–1 in his final season. Dockery was killed in a plane crash on December 12, 1983, in Lawrenceburg, Tennessee, en route to an appearance before the Quarterback Club there. Also killed in the crash were Memphis State freshman Charles Greenhill, offensive coordinator Chris Faros, and booster Glenn Jones. In December 1983, the playing surface at the Liberty Bowl Memorial Stadium was named Rex Dockery Field. After the tragedy, Rey Dempsey was hired away from Southern Illinois as Memphis State's new head football coach. His teams struggled to find success on the football field, posting a record of 7–12–3 in two seasons before Dempsey was fired. Florida defensive coordinator Charlie Bailey was hired as the new head football coach at Memphis State after Dempsey's firing. He put together a 12–20–1 record in three seasons. He resigned from Memphis State in 1989 after allegations that two of his athletes lied about contacts with school boosters. USC offensive coordinator Chuck Stobart, a former head coach at Toledo and Utah, was hired the head coach after Bailey's resignation. His teams compiled a 29–36–1 record in his five seasons. In his final three seasons, Stobart led the Tigers to winning seasons (three straight 6–5 records). Stobart resigned after five seasons. Memphis State University changed its name to the University of Memphis in 1994. Rip Scherer, previously head coach at James Madison, took over as the Tigers head football coach in late 1994. He failed to post a winning record as head coach, going 3–8 (1995), 4–7 (1996-1997), 2–9 (1998), 5–6 (1999) and 4–7 (2000). Scherer was fired due to the mediocrity and on-the-field struggles of the football program. In November 1996 the Tigers beat sixth-ranked and SEC power Tennessee, quarterbacked by Peyton Manning, 21-17 at Liberty Bowl Memorial Stadium. It was the first time Memphis had defeated the Vols in fifteen meetings, and the Vols came into the game with a 40-1 record in November since 1985. It would take another 19 years for the Tigers to defeat another nationally ranked team. Running back DeAngelo Williams set numerous school rushing records and would become as successful running back in the NFL. Larry Porter was named the new head football coach at the University of Memphis on November 29, 2009 replacing Tommy West. Porter's Tigers struggled tremendously as fan support, attendance and revenue fell. Porter amassed a 3–21 record as head coach at Memphis. On November 27, 2011, Porter was fired after completing a 2–10 season with only having won three games during his two-year tenure. On December 7, 2011, sources revealed that TCU offensive coordinator Justin Fuente would be named as the new head football coach at the University of Memphis. He was formally introduced as the Tigers' head coach on December 8, 2011, as the replacement for former head coach Larry Porter. After the Tigers opened the 2012 season with only one win over their first nine games, Fuente led Memphis on a three-game winning streak to close the season and finish with an overall record of four wins and eight losses (4–8). In February 2013, Memphis extended the length of Fuente's contract through the 2017 season as a result of the gains he made in his first year as head coach of the Tigers. Fuente's 2013 Tigers team finished the season with a 3–9 record. The 2014 Tigers football program ended the season with a 10–3 record overall (7–1 conference), making them the co-champions in the AAC (American) Conference. This was the first conference championship for the Memphis Tigers since the 1971 Missouri Valley Conference championship and the second 10 win season since 1938. The Tigers finished the season ranked #25 in the AP Poll and the USA Today poll. Coach Fuente won his first ever bowl game as a head coach that year as Memphis defeated BYU 55-48 in double overtime in the inaugural Miami Beach Bowl. On October 17, 2015, Memphis, led by quarterback Paxton Lynch upset the #13 Ole Miss Rebels 37–24 at the Liberty Bowl, catapulting the team into the national spotlight. The victory was the Tigers' first over a ranked team since 1996, when they defeated #6 Tennessee. The 6–0 Tigers entered the AP Poll the following day at #18 having been ranked in the Coaches Poll for the previous two weeks. On November 3, 2015, an undefeated (8–0) Memphis team was ranked #13 in the season's first College Football Playoff poll, the highest ranking of any non-Power Five team in the poll's history and the highest national ranking in Memphis football history. In April 2016, Lynch was selected by the Denver Broncos in the first round of the 2016 NFL Draft with the 26th overall selection. On November 29th, 2015 Justin Fuente departed Memphis to become head coach of the Virginia Tech Hokies. When the University of Memphis first fielded a football team in the fall of 1912, no one had selected a nickname for the squad. Early references to the football team tabbed them only as the Blue and Gray Warriors of West Tennessee Normal School. After the final game of the 1914 season, there was a student parade. During this event, several Normal students shouted, "We fight like Tigers." The nickname was born. More and more the nickname "Tigers" was used, particularly in campus publications. But it did not catch on with the newspapers downtown. They continued to use "Normals" or the "Blue and Gray" when referring to the University. In the late 1920s, student publications and downtown newspapers began referring to the football team as the "Teachers" or "Tutors." The Tiger nickname would return, but not until 1939 was it finally adopted as the official nickname for the University of Memphis. Memphis home games have been played at Liberty Bowl Memorial Stadium since 1965. Prior to that, home games were played at Crump Stadium. The Memphis Tigers currently hold a record of 5–4 in bowl games. The Burley Bowl was not an NCAA sanctioned Division I FBS bowl game. The Pasadena Bowl matched the California Junior College football champions against the National Junior College Athletic Association (NJCAA). ↑ "UofM Web Guidelines - Brand Standards - University of Memphis". Retrieved 2016-03-23. ↑ "Memphis Is Big East Bound". gotigersgo.com. February 8, 2012. Retrieved February 8, 2012. 1 2 "Justin Fuente is Memphis' new coach". ESPN.com. Associated Press. December 8, 2011. Retrieved December 8, 2011. 1 2 "The University of Memphis :: History :: University of Memphis". memphis.edu. 1 2 3 4 5 "Memphis Football History Database". nationalchamps.net. ↑ cristilmethod. "Bob Sanders, Discontent, and Allyn McKeen: How MSU ousted its winningest football coach ever". For Whom the Cowbell Tolls. ↑ "E. Allyn McKeen". Fanbase. 1 2 3 "Long-time Former Head Football Coach and Athletic Director Billy J. Murphy Passes Away". gotigersgo.com. 1 2 "Billy Murphy". College Football at Sports-Reference.com. ↑ "Fred Pancoast recalls his career". vucommodores.com. 1 2 "Carolina Panthers: Richard Williamson". panthers.com. 1 2 "Richard Williamson". College Football at Sports-Reference.com. 1 2 3 4 Les Smith (31 October 2013). "Liberty Bowl field rededicated for Rex Dockery". myfoxmemphis.com. 1 2 "The Rex Dockery Award". Bradley Central High School. Retrieved 2009-01-04. ↑ "Rex Dockery". College Football at Sports-Reference.com. ↑ "Rey Dempsey". College Football at Sports-Reference.com. ↑ "The Tuscaloosa News - Google News Archive Search". google.com. ↑ "Charlie Bailey". College Football at Sports-Reference.com. ↑ "Stobart Is Hired by Memphis St.". latimes. ↑ "Charles R. "Chuck" Stobart Records by Year". College Football Data Warehouse. Retrieved 2009-08-17. 1 2 "Chuck Stobart". College Football at Sports-Reference.com. ↑ "Rip Scherer Bio - GOTIGERSGO.COM - The Official Website of the University of Memphis Tigers". gotigersgo.com. ↑ "Rip Scherer". College Football at Sports-Reference.com. ↑ "Memphis Fires Rip Scherer". Memphis Flyer. ↑ "Memphis Stuns No. 6 Tennessee; Alexander Is Great for Alabama". latimes. ↑ Ben Garrett. "Tennessee-Memphis: "Remember 1996" Is Vols' Rallying Cry". Bleacher Report. ↑ Phil Stukenborg, The Commercial Appeal. "West's contract extended at Memphis". KNS. 1 2 3 4 5 6 "Tommy West". College Football at Sports-Reference.com. ↑ Phil Stukenborg. "Tommy West fired as Memphis Tigers football coach". MCA. ↑ "DeAngelo Williams Bio - GOTIGERSGO.COM - The Official Website of the University of Memphis Tigers". gotigersgo.com. ↑ "Carolina Panthers: DeAngelo Williams". panthers.com. ↑ "Former Tiger Running Back Larry Porter Named Memphis Football Coach". gotigersgo.com. ↑ "Memphis Tigers hire LSU Tigers' Larry Porter to rebuild program". ESPN.com. ↑ Geoff Calkins. "Geoff Calkins: Memphis Tigers coach Larry Porter making job tougher than it has to be". MCA. 1 2 "Memphis fires coach Larry Porter". ESPN.com. ESPN.com news services. November 27, 2011. ↑ Stukenborg, Phil (December 7, 2011). "TCU's Justin Fuente named football coach for Memphis Tigers". The Commercial Appeal. Memphis, TN. Retrieved December 7, 2011. ↑ Schad, Joe (December 7, 2011). "Memphis to hire Justin Fuente". ESPN.com. Retrieved December 7, 2011. ↑ Stukenborg, Phil (November 24, 2012). "Memphis Tigers clobber Southern Miss for third straight win". The Commercial Appeal. CommercialAppeal.com. Retrieved December 9, 2011. ↑ "Memphis extends Justin Fuente". ESPN.com. Associated Press. February 13, 2013. Retrieved February 14, 2013. ↑ "Memphis Tigers vs Connecticut Huskies - Recap". ESPN.com. ↑ "Memphis 2014 Schedule - Tigers Home and Away - ESPN". ESPN.com. ↑ "Miami Beach Bowl Recap". ESPN.com. December 22, 2014. ↑ "2015 NCAA College Football Polls and Rankings for Week 10". ESPN.com. November 3, 2015. ↑ "Memphis Tigers Official Athletic Site - Traditions". gotigersgo.com. 1 2 "2009 Memphis Football Media Guide". gotigersgo.com. ↑ "Memphis Tigers Football Schedules and Future Schedules". fbschedules.com. Retrieved 2012-02-22.